It was just a few days back, I was discussing how the internet of things is bringing exceptional changes in the healthcare sector. Well, with the term IoT dating back as far as 1999, it seems I am quite late to talk about this. So, why am I talking about this now? If you pay a closer attention, you’ll believe how the Internet of Things has started a new era of data connectivity. It is surpassing everything that we’ve seen in the past few years. Over these years, IoT mobile app development has slowly taken a stronghold- to create a Jetson-esque future. And it’s overwhelming for me to watch the next mobile future emerge with full force – which is bringing an exceptional enterprise and consumer innovation. But how? Before we move further, let me quickly brief you about IoT- the Internet of Things! IoT is the network of physical ‘objects’ like- vehicles, smart devices buildings, and stuff – embedded with software, electronics, sensors and internet network connectivity which makes these ‘objects’ collect, share and execute data. Practically, Internet of Things is all about implementing micro-sensors and microcontrollers on physical things to turn them into smarter objects. This allows everyday objects around us to communicate with us, share data and also listen to us at times. So anything that generates data is considered to be IoT – be it in our natural or unnatural environment. And that includes RFID devices, smart parking meters, smart homes, drones, smart cars, smart watches, smart glasses, health monitors, sensors and even human tissues- operating with IoT mobile app development! But Why Is IoT App So HOT Right Now? With the promise to bring immense comfort and value into our lives, Internet of Things is gaining massive interest. We are living at a point where we have smaller, more powerful connectivity, built in wifi systems. And at the same time, the cost to build and maintain the network for device communication has dropped dramatically. Take Nest for example. The IoT enabled smart thermostat company has a promising sale of one Million every year. Tesla, in the year 2013, introduced a completely interactive vehicle display that made driving a different experience. Practically, now you can stream live security videos on your smartphones and monitor your health at the same time. By connecting all of the ‘things’ that surround us, what we can achieve is truly MAGIC. But since IoT is a yet unexplored concept, many are still confused about the far-reaching potential of IoT and apps. 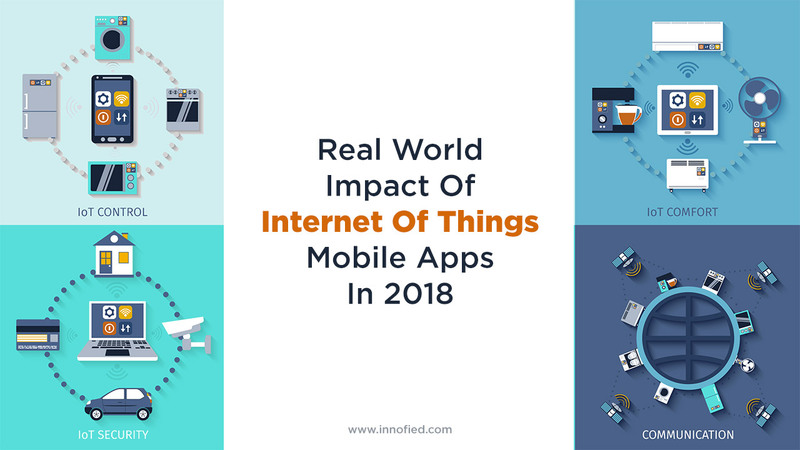 To clear things up, let’s explore what IoT mobile app development has kept for all of us, especially startups and enterprises. What’s There For Me In Internet Of Things? Though consumer understanding about IoT is still in the blooming stage, big enterprises have invested in critical IoT infrastructures. FedEx, John Deere or Maersk – they are coming up with an end to end Internet of Things app integration for leading industries like asset tracking, logistics, automotive, security, and health. This incredible Infographic by RS components breaks down how the Internet of Things is on the verge of changing lives. It’s clear that efficiency is what we all are rooting for with IoT mobile app development. And with ‘efficiency’ I mean more production at a lesser cost- bringing more profit to different industry. So which top industries are the major breeding ground for building IoT applications? The transportation industry is one of the top industries benefited by IoT. Smart IoT enabled sensors doing data communication is allowing companies to remotely control, track and maintain their vehicle or the entire fleet. And it was definitely needed. with smart IoT enabled applications. Right from a personal level to wide scale, monitoring would become easy as pie. Now if the data of one city gets shared with another city, imagine how big the intelligence system would become – accumulating a gigantic data. And on a personal level? It will make driving a mess-free job. By optimizing destination routes based on environment, you can avoid accidents, hazards and traffic jams. Not only that, the ‘infotainment’ will let you stream music of your choice or navigate the route for you. Perhaps safer roads will be a reality soon! What do you think? Internet of Things in manufacturing is not new. Production facilities around the world have started relying on machine learning, smart sensors, and smart devices to bring management in line. Also known as smart manufacturing, IoT devices will improve the overall efficiency and productivity of machines. Using retrofitting sensors to the equipment and assets, tracking and monitoring equipment will be at your fingertips. More sensors are embedded in manufacturing equipment and placed at factories to identify the bottlenecks of the whole process. And the best of implementing IoT in the manufacturing industry? Predictive Maintenance! Machines are the base for manufacturing industries. Performing routine maintenance is a definite pain. Manufacturers perform preventative maintenance before they break. But IoT has enabled predictive maintenance – now you can predict exactly when your machine needs maintenance using advanced analytics and sensing. This means you will only service your machines when they need it- cutting down the excess cost and time spent. So it seems, IoT mobile app development for manufacturing is definitely a profitable deal. Whenever we walk into our homes, a lot of time we go about days with lights turned on, heat turned up, even when we are not present. These habits not only turn up in dollar figures but also ruining our environment. Lights, thermostats, ACs and other appliances are kept on even when people at not present due to forgetfulness. And a hefty price is what you pay in return. A solution for this? IoT enabled smart technology can react to the empty rooms. It can turn off the light, HVAC, and ACs to reduce unnecessary use. IoT mobile app development can reduce the amount of energy we use. With an intelligently processed algorithm that micromanage our activities in real time, smart IoT devices can monitor – lighting, temperature control and reduce various energy uses. Proof? Google cuts 15% of their energy usage in their data centers. Startups investing in smart energy can hence think of developing a smart facility that can collect data in real time and react accordingly. It can be on a granular or a massive level. This collected information can be used to let the smart devices make decisions about everything about energy. The retail world is soon going to be revamped. Thanks to IoT which is camouflaging physical and e-commerce deals. Amazon Go is well ahead in this game. It is a new kind of e-commerce store where you don’t need any checkout- just grab and go. No lines and literally no checkout at billing counters. Using the Amazon Go app, your movement is detected whenever you grab a product from shelves. Shortly after you leave the store after taking all your products, Amazon will charge you from your Amazon account. This is one of the greatest examples of practicing IoT mobile app development in the retail industry. That is not it. One of the high street fashion brands Gap has trailed AR changing rooms to potentially trail clothes without actually putting them on! How convenient is that? With IoT also changing the farming scenario with connected supply chains, supermarkets can have the products at very low cost. Also, products will be sent only when there is a need for customers – which will also decrease the food waste – a complete win-win situation. 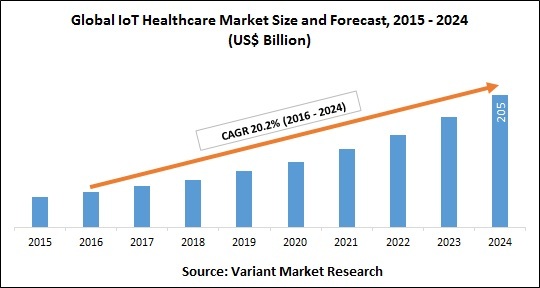 There have been tremendous changes in the healthcare industry since the introduction of IoT. People are now more conscious about their health as IoT apps let them track their movements better. Not only on a personal level, but bigger healthcare organizations like hospitals and clinics are also implementing different IoT technologies. Right from smart pills, to smart beds, RTLS tagged healthcare equipment and trackable IDs – Internet of Things have made it easier to keep things under control. By overcoming these challenges, IoT healthcare solution is benefitting healthcare in different ways. It helps in reducing operational costs, decreased error with data handling, better patient treatment, and hence better patient outcomes. Considering all of these aspects, it is obvious that IoT is going to be the biggest revolution in the coming future. Since it’s happening right on time, it is going to improve the aforementioned industries. IoT will have the necessary user data to understand and monitor customer behavior and hence improve customer experience. With time, there will be numbers of IoT apps that will benefit businesses and customers worldwide. So, do you have any IoT mobile app development idea? Comment below to have a discussion.